His main responsibility for the Bronx Bombers Is to find and recommend the best players available in the tri state area. If you know Cesar Presbott than you know that he loves Baseball but he loves people more. He is very loyal to the Yankees and he is very loyal to his players. Cesar was actually signed to be a Yankees scout by Lou Piniella and Billy Martin. They saw something in Cesar that only a true baseball man could see in him. Billy Martin called it big cojones. If you don’t know what that word means,just ask any Spanish guy. Through the years he has signed many players but his biggest to date has to be Dillon Betances. Betances is a big man but a gentle giant. Cecar has a passion for helping people both here in New York and in the Dominican Republic. Here in NY he loves to help the young and the hungry. 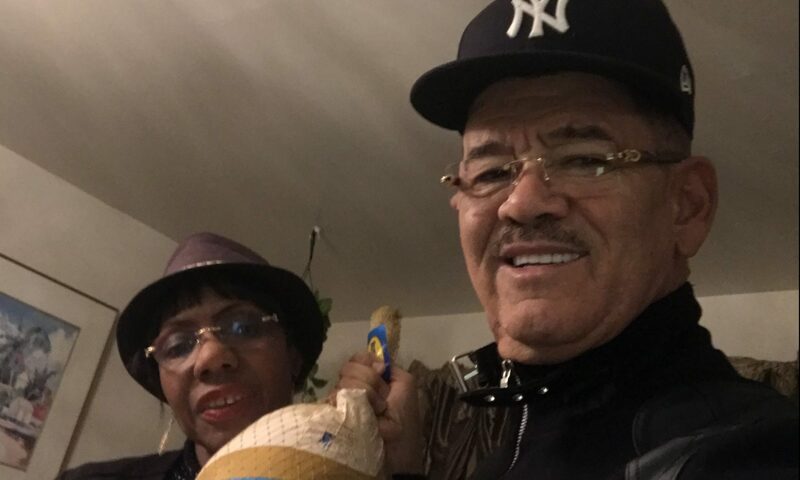 For years with the help of many baseball people he has made sure that the poorest families always had a happy thanksgiving. On thanksgiving day he and his wife and what ever player is available go to a local shelter to make sure that those people are properly fed. Dylan would like to stay a Yankee however he understands the business of the game. He also said that he was surprised at the fact that joe Girardi was let go but feels that the Yankees are headed in the right direction. He also thinks that CC Sabathia should be brought back. I told Dylan that if he didn’t come to the turkey event a lot of people would of understood but he said that I know what this event means to Cesar and i would never disappoint a man that does so much for people. There were over a thousand turkeys given away. However the thing that really hit me was a lady leaving with her three kids saying thank God that now we can have a good thanksgiving. I may be biassed but as Cesar Dylan and I know……this is the Yankee way. Jersey Boys, the Broadway play, may have closed on Broadway after ten years, however for the people that just can’t get enough of Frankie Valli and the Four Seasons, they can still get the real thing. The great Frankie Valli made his annual New York appearance in Westbury this past weekend. For myself and fellow Four Seasons “junkies” it couldn’t come quickly enough. For me, the highlight is to be able to get to the theatre early and watch a musical genius like Frankie Valli prepare for the show with his musical director Robby Robinson, today’s Four Seasons and the rest of his band during the sound check. Robby Robinson starts the rehearsal by going over the roster of songs that they will be performing with the full band. The Four Seasons go over the back ground vocals until Robby feels that it’s perfect. Then the ageless Frankie Valli walks on stage and goes right to work. Frankie doesn’t miss anything during the shows preparation, every sound and every beat from all the instruments must be right on. He doesn’t want to disappoint any fan at his sold out shows. He will go over all songs until it sounds perfect and only then do you see a satisfied look on his face. Frankie reminds me of a champion boxer preparing for a title fight and Robby Robinson reminds me of his coach getting him ready for the event. Frankie also reminds me of how Yankees manager Billy Martin looked when batting practice ended and his team was about to play a big game. As he starts to leave the stage to head back to his dressing room Robby says,” Frankie, Ray is here.” Frankie looks over, sees me and says, “Get up here!” I don’t walk, I run up to the stage and give one of my true heroes a hug. We go backstage where there is a huge spread-Italian food that looks incredible, from Patsy’s, which is Frankie’s favorite restaurant in New York City. Of course, it was also Frank Sinatra’s favorite place. Frankie says let’s get some food and sit in my room. We talked about music, baseball and life. Frankie, as everyone knows, idolized Frank Sinatra and was very close to him. Frankie has many great memories with old blue eyes. One of the things that he shared with me was that no matter what Tom Lasorda says, Frank Sinatra was a true Yankee fan. Frankie also has nice memories with Joe DiMaggio and is forever grateful that during a period when DiMaggio didn’t like to sign autographs, he would get a baseball and sign it for Frankie’s son. Knowing DiMaggio as I did, that was respect because I saw him reject some dignitaries at times. 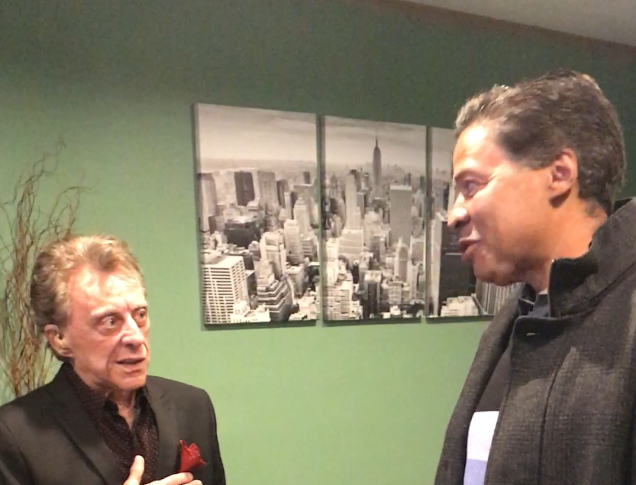 If you know Frankie Valli than you know that he is a really good guy and I can guarantee you that’s the reason that DiMaggio gave him true respect. While sitting there, Dean Egnater, who has been with Frankie for as long as I can remember as his tour manager, walks into the room to go over some things and then Alan Gaba, assistant tour manager, comes in to check on the man and of course Stewie Stone, the comedian that has been opening Frankie’s show forever, comes in with his food, sits down and tells some very funny stories. Stewie actually lives in the same building as my boss, Yankees President Randy Levine, and he says, “The next time I see him I’m gonna ask him for a raise for you.” I start to laugh and beg him not to do that. Some of the band members like drummer Craig Pilo and singers Brian and Brandon Brigham, Todd Fornier and Erik Bates actually address Frankie as “The Boss.” I tell Frankie that that’s how we addressed Mr. Steinbrenner. Frankie smiles because he can tell that I still miss my boss. Then he responds by saying that he is glad That the Steinbrenner family has kept the Yankees, Thier brand is to important for the game. As for the show itself, what can I say? Sherry, Swearin’ to God, My Eyes Adored You, the hits go on and on. The man is still on top of his game. I can say that because the fans were really very happy. When you hear all people both young and old saying Man what a show, nothing else needs to be said. Go see Frankie Valli and the Four Seasons at a city near you. Luis Castillo has spent much of these last couple of months filling trucks with supplies to send to Puerto Rico. Luis is a young man with Puerto Rican and Dominican parents. He has a lot of family and friends that are suffering in this enchanted island and refuses to stop trying to help. Luis is a person that for the longest time has understood that as being born in the Bronx, he needs to always be able to help his community. He has two young sons and knows that he must always be an example to them. All of these incentives to do the right thing he credits to his eight years with the New York Yankees as a Batboy and clubhouse attendant. He says that while with the Yankees he discovered that being a Yankee was more than just playing baseball. He used to listen to some of the players like Derek Jeter and David Cone talk about the importance in helping and giving back to people, especially the less privileged. Through Jeter, he was able to understand about charity foundations and how you could use them to help the kids. At that point, he decided that one day he would create his own foundation and help kids in the Bronx and make sure that they always have back packs and appropriate school supplies etc. I asked him about how life with the Boss, George Steinbrenner, was in the clubhouse. He said that even though most of the guys would get extremely nervous when the Boss came around, he only noticed true kindness by the Boss towards all of the kids. Luis told me of the time that the Boss was just sitting in the locker room while he was taking out heavy bags to a storage area. The Boss actually asked him if he could help him with the bags. Luis said.” No thank you I’m ok.” The Boss kept staring at Luis as he worked hard at completing his assignment. When Luis finished, the Boss called him over went into his pocket and gave Luis two hundred dollars. He told Luis that he appreciated his hard work and wanted to give him a little bonus. Luis speaks of his time with the Bronx Bombers with great and true appreciation. As in the movie, “Goodfellas” Luis said that it was a glorious time. If you know anything about the Yankees, it’s a Martin Scorsese movie anyway. You would have to agree with him considering that they went to playoffs and/or the World Series just about every year while he was there. I asked him if there were any regrets that came with the job and he said that as in all phases of life, yes of course. However, being with the Yankees, the good far outweighed the bad. In the Bronx a lot of people remember the world champion batboy that Derek Jeter nicknamed Squeegee. 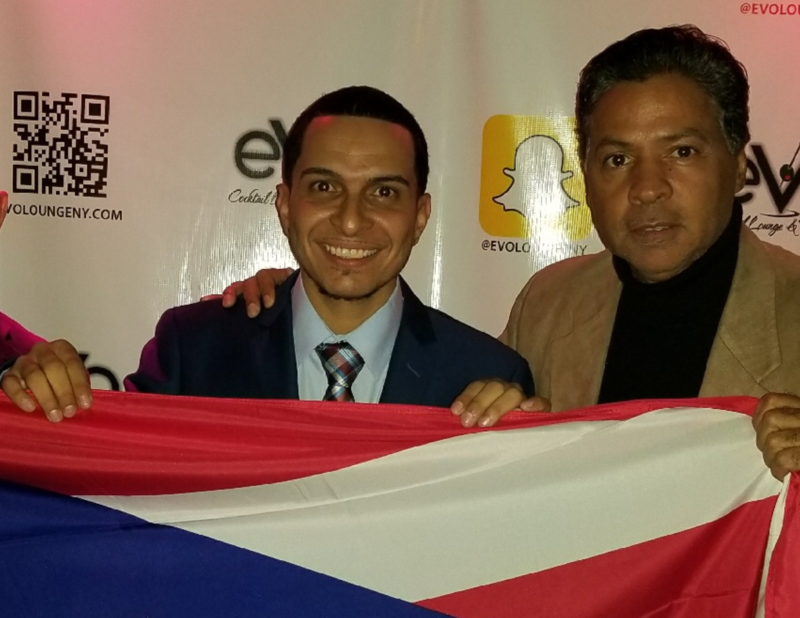 This weekend the community showed its love and appreciation by honoring Luis “Squeegee” Castillo, at the Evo Lounge in New York, for everything he does to help the less privileged both in the Bronx and in Puerto Rico. The New York Yankee organization should forever feel proud that they have taken so many kids from the streets of New York and helped make better people of them and have taught them so much about helping others. 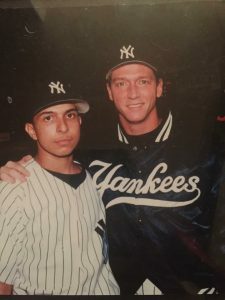 I was once one of those kids and without the Yankees I don’t know where I would be today and the same for Luis and so many others that have become wonderful citizens all around our country because of the Yankees influence. I know that Luis is grateful for his opportunity with the Yankees and the fact that he is a better person for it. Like me, we are batboys forever. If you’re a true Yankee fan than you remember July 4th 1983. Yes, it is the birthday of our great country and the birthday of George Steinbrenner, however it is also the day that Dave Righetti pitched a no hitter against the Boston Red Sox. It was the first no hitter since Don Larsen’s perfect game in the 1956 World Series against the Brooklyn Dodgers. The other night, I had the pleasure of reuniting with Rags, as Righetti was affectionately known by his teammates. 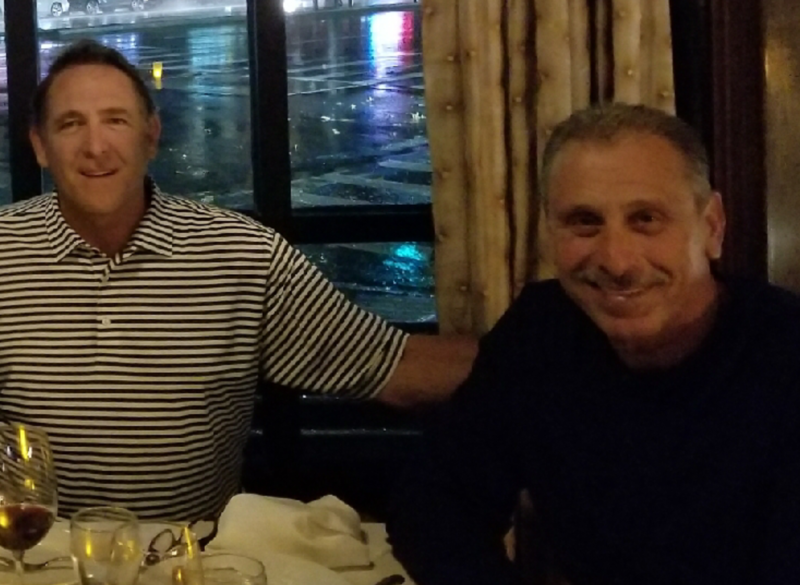 He came out to Long Island to help his former bullpen catcher and present day head baseball coach at Adelphi University, Dom Scala, raise funds for the upcoming baseball season. The event was held at Chateau Briand in Carle Place. The room was filled to capacity with over 350 supporters of the Yankees and the great baseball program that Adelphi has put together through the vision of Coach Dom Scala. Most people don’t know that Dom Scala was in the bullpen that July 4th and was the person that prepared Rags for that game. If I’m not mistaken, it must’ve been about 100 degrees that day and Scala would only recommend that Rags throw only a certain number of warmup pitches because of the heat. That may or may not have made the difference in Rags’ success that day. I like to think that it did! The rest is history-he pitched his historic no hitter. The former president of the United States, Richard Nixon, went to the clubhouse to congratulate Righetti and the no hitter turned out to be one of the best birthday gifts the Boss had ever received. Last night, Righetti spoke about his three World championships with the Giants . He spoke about his wonderful marriage and his pride in being a father to his three kids. At one point he cried because of how blessed he has been with his incredible family. At that point quite a few of us in the audience started to cry because of how beautifully he shared such a private story. At that point I decided to take away some of the tension by asking Rags if he still did his Elvis Presley imitation. He started to laugh and said that if I asked to do it that he wouldn’t. 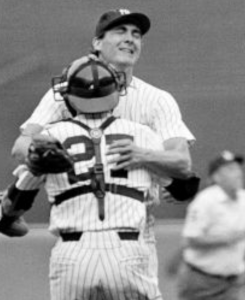 The great thing that Dave Righetti and Dom Scala have in common is that they are still in love with being a Yankee. Whether you were a batboy, warmed up pitchers in the bullpen or got to strike out future hall of famer, Wade Boggs, to win a no hitter, as long as you got to wear that pinstriped uniform you are forever a New York Yankee. I know Tony Bennett says he left his heart in San Francisco but in this case I think Rags left his heart in New York. 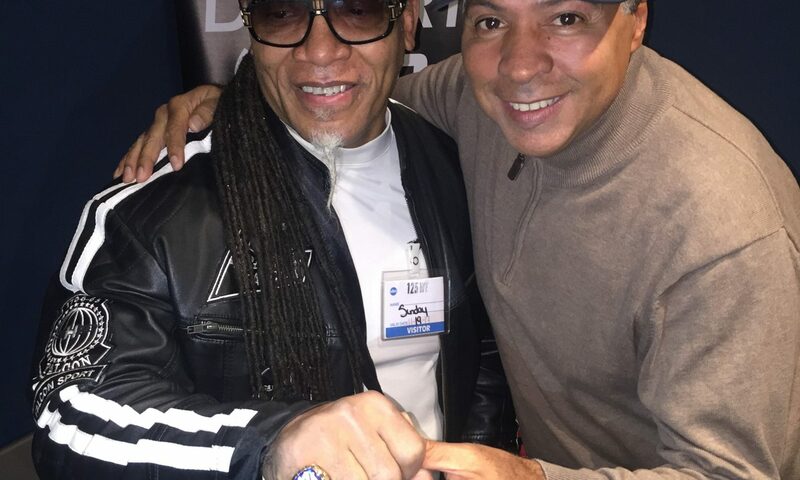 Weekends belong to Ray on 1050 ESPN Deportes, Sat. and Sun. from 12pm – 2pm. Read Ray on Newsmax. For the last twelve years I have had the honor of being a board member of the Ted Williams Hall of Fame. In 2006, I had the honor of being acknowledged for my community service. If you know any thing about Ted Williams then you know that community service was very important to him. It was a subject that he shared with George Steinbrenner. When Ted first opened the museum, the Boss was one of his very first guests. As a board member, I have the thrill of nominating and being involved in the selection process of the inductees. Last year, I had the pleasure of selecting my childhood hero Gene Michael. After the event Gene made me cry when he told me that it was one of the biggest moments of his baseball career. The year before, museum president, Dave McCarthy asked me about the great pitcher that had recently retired, Roy Halladay. I remember calling my good friend and Halladay’s former manager of the Phillies, Charlie Manuel. I asked him about Roy’s character as a person. Charlie said he was all that and more. An Incredible team mate and his work ethic was like no one else. He also said that more than a player he was a hall of fame person. I reported this to Dave Mccarthy and he said that was all that we needed to hear. 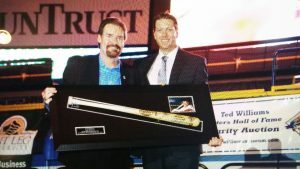 I will never forget that after the ceremony Roy said that being inducted into the Ted Williams Hall of Fame and receiving Ted’s signed bat was an incredible thrill. He was very quiet with the exception of how many times he had said thank you. The other thing that impressed me about Roy Halladay was that he came back to the ceremony the next two years to honor the former players that were to be inducted. Very classy act by a very classy man. I didn’t really know Roy the person with the exception of the time spent with him at the Ted Williams Museum. I feel great pain for his beautiful young family, wife Brandy and his two young sons. To say that it reminds me of my wonderful friend Thurman Munson, who we lost in 1979 at the age of 32 because of an airplane accident, would be an understatement. 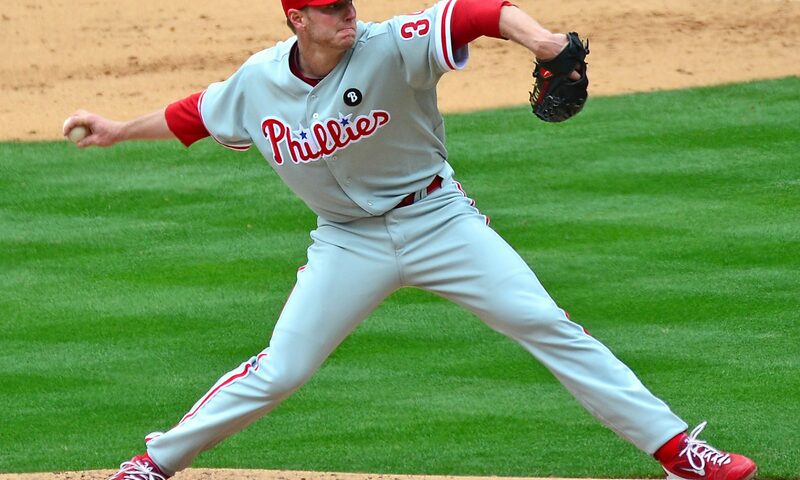 I just want to say that the Ted Williams Hall of Fame will never forget the beautiful moments that Roy Halladay gave us. We will miss you and Gene Michael so very much. Thank you Roy for the nice humble person that you were. The kids that idolized you will forever be better people because of it. A special thank you to Ted Williams daughter, Claudia, for always keeping her dad’s dream alive.